Use our Learning Management System to assign tasks, track progress and view results for your students all in one place. Our Learning Management System was created after extensive research into current working practices in secondary schools, private language schools and universities. The LMS was then built to be as flexible as possible, allowing teachers/administrators to manage their students' work in the way that best suits them. 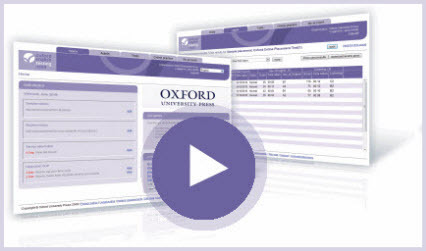 You use the system to assign the Oxford Online Placement Test, and our online exam practice tests. Set up administrators, teachers, placement groups and classes in the way that best suits your organisation. Track your students' progress to see how they are getting on. Easily sort results to create different reports and export them as Excel or text files. Print or email a customisable Results card to your student. Move placement students into regular classes to start their courses. The LMS gives teachers and administrators full control over their students' access to tasks. Students can be created quickly, sent a unique set of login details to access their tasks, and be tracked throughout their work. You can then view, sort and download the results. How do students access their tasks? Students log in using the details the system creates for them. Placement test students then directly start their test. Practice test students have their own LMS where they can see messages from their teacher, access their tasks and review completed tasks. Everything is delivered via the Internet. You do not need to install or maintain proprietary software. See the system requirements page for more details. Can we have a free trial of the LMS? Yes, to sign up for a free trial simply register by clicking the link below. You will be given full access to the LMS as well as a selection of sample practice tests.